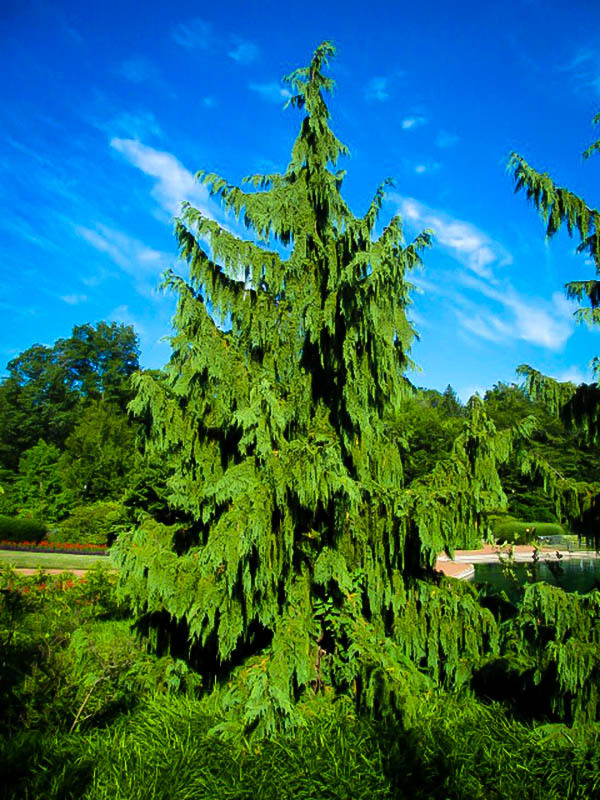 The Weeping Alaska Cedar is a beautiful evergreen tree of medium size that makes a striking specimen in the garden. It has an upright central trunk, and widely-spaced side branches that grow out horizontally, but from those branches pendulous sprays grow, falling straight towards the ground and giving this tree a unique and special form. It will really stand out and turn heads, so place it in an open area, not crowded by other plants, so that its great beauty can be fully appreciated. 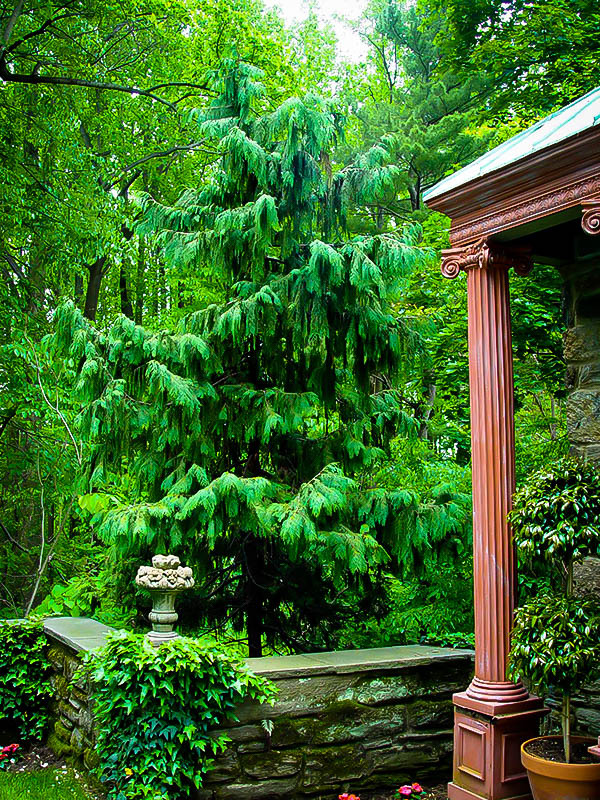 This tree will grow steadily until it is perhaps 30 feet tall, but often it will be smaller, and with its narrow outline it will fit well into a smaller garden, making a real statement without taking up a lot of room. 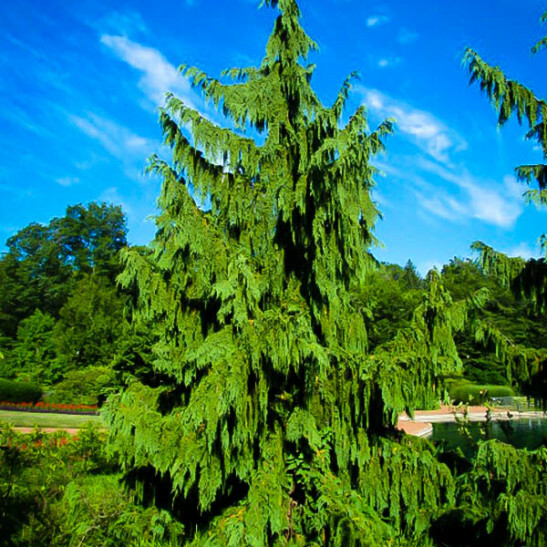 The Weeping Alaska Cedar should be planted in regular garden soil that is well-drained but does not become completely dry in summer. Young trees should be watered regularly during dry weather. 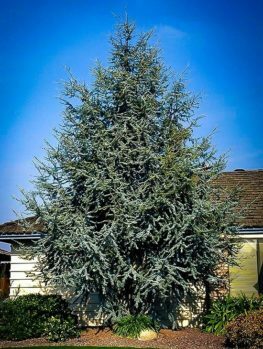 Otherwise this tree is free of significant pests and diseases, needs no pruning, and grows all by itself, making it an ideal choice for a low-maintenance garden. Plant it in the lawn as a specimen, among other evergreens in a bed, among boulders and gravel, or even in large pot, where it will decorate a terrace or patio for years. The Alaska cedar is a majestic tree that grows wild all along the Pacific coast, from northern California to south-eastern Alaska. Wild trees have a slightly weeping appearance, but in the Weeping Alaska Cedar this has been taken much further, giving us a wonderful tree with horizontal branches and long, cascading side-branches dropping vertically to the ground in a most graceful and striking way. In gardens it can be grown all across the cooler, moister parts of the country, from east to west, and it makes a beautiful specimen tree in any garden. 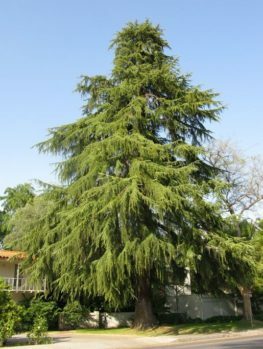 The Weeping Alaska Cedar is ideal as a specimen evergreen tree, as it will only grow to around 30 feet tall, and often less, which is large enough to make a real statement in your landscaping, but not so large that it overpowers your garden, as some evergreens can do. The flattened sprays of foliage are blue-green when young, turning to grey-green as they age, adding a graceful and calming note to the colors of your garden. 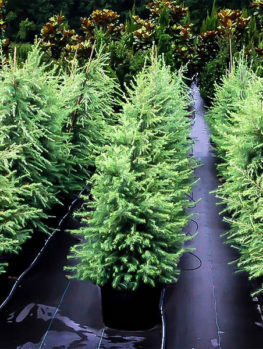 It has a single, upright central trunk, with a nodding tip, so your tree will not grow too wide, remaining narrow and contained. Older trees may produce small ½ inch rounded cones on the branches, which add a decorative touch to the tree. 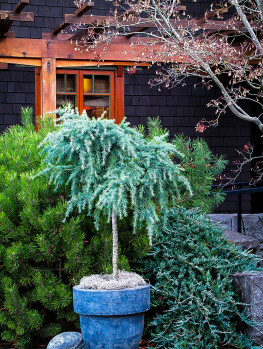 Choose a sunny or slightly shaded spot for your Weeping Alaska Cedar, and plant it as a specimen in an open spot, where its beauty can be enjoyed, not crowded by other plants. It can also be planted in a corner of a building, where its narrow form will fit between windows. Plant it in the lawn, or in a bed with other evergreens, perhaps mulched with gravel and decorated with boulders. Since it needs no special care, this is an ideal choice for anyone making an attractive garden that is also low-maintenance. The Alaska cedar is also called yellow cedar and Sitka cypress, since it is a close relative of the cypress trees, and not really a cedar at all. It grows all along the coastal areas of Western North America, from the cooler northern parts of California, up through Oregon and into Canada all the way to southern Alaska. The wild tree already has a tendency to produce weeping branches, but the Weeping Alaska Cedar has been specially selected to have perfect, cascading side-branches hanging from its main limbs, giving it an incredibly elegant charm. 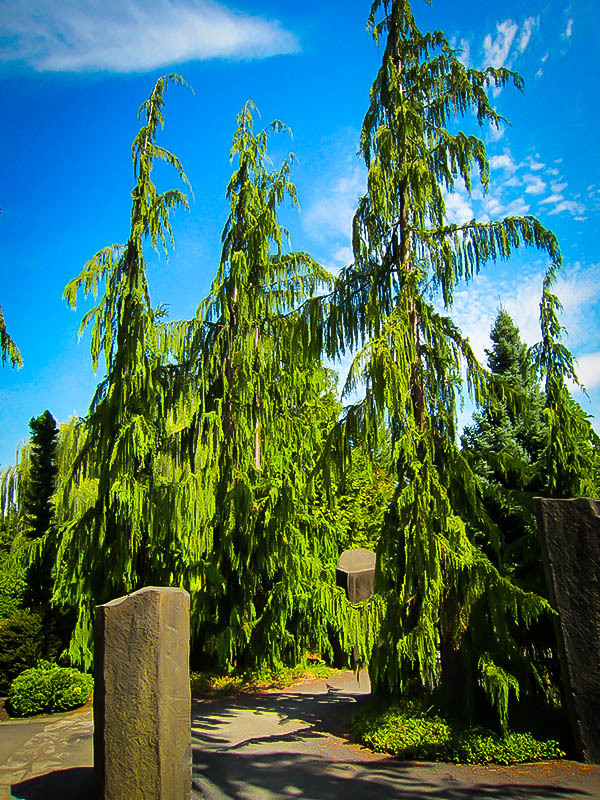 For this reason our trees are grown by selecting pieces from mature, weeping specimens, and attaching them to the roots of seedling Alaska cedars, so that the special weeping habit is carefully preserved. Avoid cheaper seedling trees that will not have this highly-decorative feature. Your Weeping Alaska Cedar will grow in most kinds of soil, but it will do best in richer soils, so add plenty of organic material when planting. Choose a spot that is not constantly wet, but that does not become completely dry during the hot weather. All across the country, in all the cooler parts, this tree will thrive and easily survive temperatures down to minus 30 degrees. 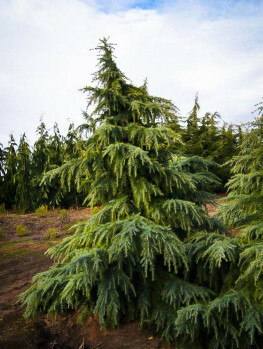 This tree does best with wet winters and summers that are not dry, so if you live in very hot areas, with dry conditions, choose a more drought-resistant tree like the Arizona Cypress, or Italian Cypress, that also make striking specimen evergreens. In today’s busy world, most of us are looking for plants that are beautiful and special, but that don’t need a lot of work to thrive. 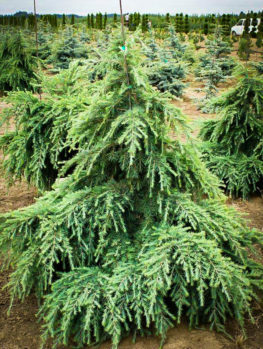 The Weeping Alaska Cedar is a plant and forget tree that will be attractive all year round, in all weathers. 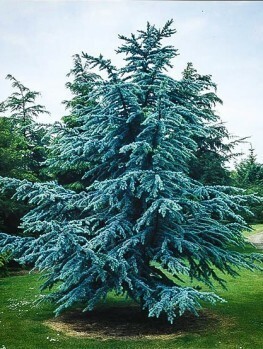 It has no significant pests and diseases, and it doesn’t need any special pruning or care to show its lovely cascading form, which develops naturally with no work from you. The older your tree gets the more beautiful it will become, until you have a feature worthy of the best gardens around. If you are looking for something special and you live in a cooler region, then this tree is exactly what you are looking for. With its unique form it will bring a touch of class and elegance to you garden, giving you something that stands out and makes your front-yard unique. We have a good supply of high-quality plants from our specialist growers, but the demand is high, so order now to avoid being disappointed and having to settle for the ordinary.